‘Tis the season of the gimmies. This time of year the sudden onslaught of toy ads turn ordinarily mild-mannered children into presidents of the I-Want-That Club. As Santa’s list grows, it is important to teach our children (and remind ourselves) that the holidays are about more than the gifts. Greeting cards are a holiday tradition and nursing homes are filled with patients who would love to receive hand-crafted greeting cards from your mini Picasso. Enlist the help of your little artist’s friends and host a card-making party. Instead of asking guests to bring munchies, use SignUpGenius.com to ask guests to bring art supplies such as paper, glue, glitter, ribbon, crayons, etc. to create their masterpieces. Not only will your card maker benefit from this lesson, their friends will too. Generosity doesn’t have to be limited to people. Shelters are full of animals that could use some TLC. While opening your home to adopt a new friend may not be in the cards, you can help your animal lover collect old towels for a local shelter. Towels are often in high demand at shelters, and it is easy to ask neighbors and family members to donate unwanted towels for the project. Since you can personally take the linens to the shelter, this is one project your kiddo can see make a difference. Help a local shelter meet holiday demand by showing your child how to organize a food drive. SignUpGenius makes quick work of inviting friends and neighbors to participate in a food drive. Simply input the food items most needed by the shelter and ask participants to sign up for the items they want to donate. After all of the food is collected, delivering the items to the shelter will further impress upon your little one the importance of giving. Collect money for a family in need using SignUpGenius Payments! 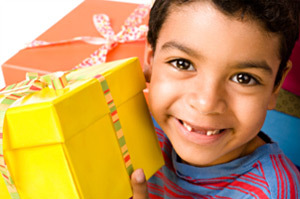 Donating toys for children who might otherwise not find a gift under the tree is a great way to give back. But toy drives need more than just toys; they need people to help distribute the gifts. Older children can volunteer their time to help, and you can help your local toy drive get organized by suggesting SignUpGenius to help keep track of volunteers and shifts. It is especially hard for our men and women overseas to be far from home during the holidays. Through organizations such as Operation Shoe Box your kids can adopt a soldier pen pal. Through an exchange of letters, your child can learn more about what it means to serve others while sending a little joy. This ongoing project will last long after the tinsel has been packed away. While there are plenty of people stateside who need assistance, it is also important to teach children an international view of the world. Through Samaritan’s Purse your kiddo can give to a child overseas. By packing a shoebox full of small toys, hygiene items, candies and more, your child can send a smile to a family on the other side of the world. Taking a moment between festivities to teach children about the power of giving not only helps establish generous and caring characteristics, it also reminds everyone to reflect on the beauty of the holidays. So this year when the gimmies begin, take them as an opportunity to teach a life lesson that reflects the season – it is better to give than to receive. Coordinate Your Holiday Party Now!